Hope you are all well :) I've been crazy busy getting my house and family ready for....VACATION. Wohoo. We leave early tomorrow morning for the Caribbean and I'm thrilled. Also, exhausted, feel like I've been going nonstop, just to get ready to go. Plus...Digit-al Dozen week is upon us again. I simply couldn't miss it because we are doing my all time favorite this month - TAPE. I've gotten all of them done, now the race to see if I can get them all scheduled to go up. I'll also have a bunch of awesome guest posts for you once the DD week is over. So, this is the first one I created and it pained me to take it off to keep going. I simply adored it. I used 4 of the 6 China Glaze Sunsational Jellies for this tape mani. Showing you the steps I took to make this one. Started with 2 coats of OPI My Boyfriend Scales Walls and then used striping tape to make a neat stripe of China Glaze Isle See You Later. Added China Glaze Are You Jelly?, again using striping tape. 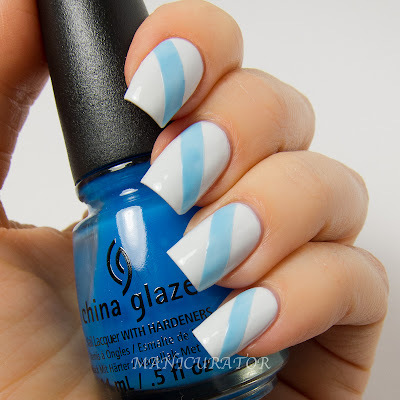 China Glaze Keepin' It Teal as the middle horizontal stripe. I love the way these jellies layer over each other. All have perfect jelly formulas and pop very nicely over white. I used two coats for each shade. And finally, China Glaze Shell-O as the middle vertical stripe. I loved this one! Really wish I could have worn it longer!! Are you a fan of jelly finishes like me? Wow, I really like it... it is delicate but impressive and elegant. Compliments! Oooh! Super pretty! I love it! This is [erfect and shows why i still want these polishes! 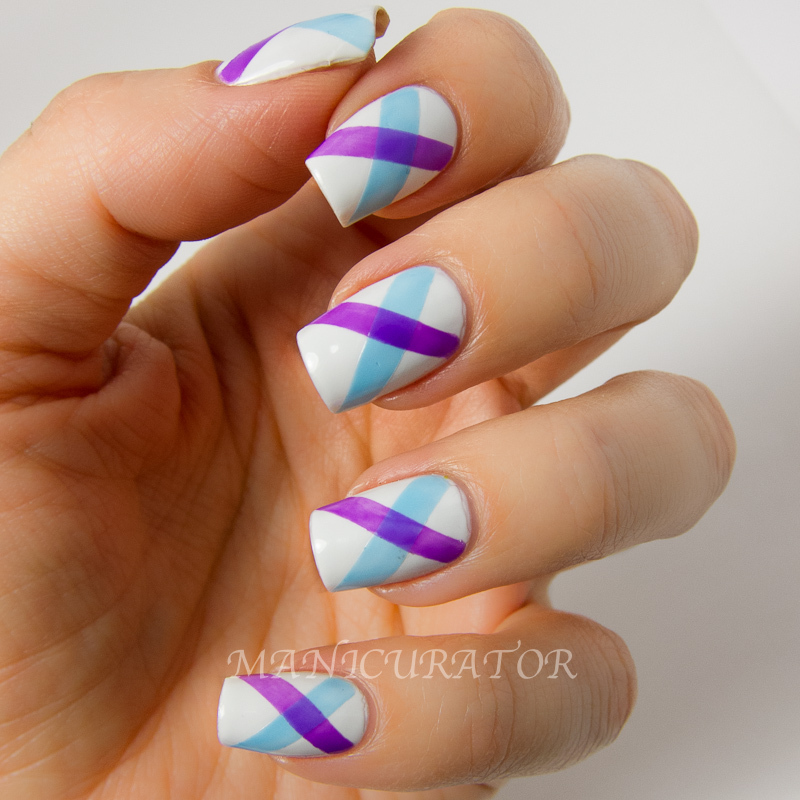 What an amazing mani! It's like you've layered tissue paper over your nails only without any of the crinkling and PITA nature of tissue paper. Congrats, it's a super mani! I L O V E China Glaze jellies! I' have only Keepin' It Teal, but I want more more more! I kind of hate jellies, but here I am wanting all four of these so I can totally copy this manicure. Looks pretty! How long did you wait between each stripe before doing another stripe? This is soooo awesome, the way each color makes a new one when layered...you are a genius. Those stripes turned out perfectly! I love the way the jellies layer over each other. love this! the jellies give this look so much depth! Did you paint on the stripes? How did u do it? Striping tape? Where do you get that? Ah very nice -- love this pattern!